Naysayers Be Gone! We Want To Hear The Clatter of Molds Being Broken! “You can’t play rock without guitar!” The members of Clatter have heard that probably more times than they care to count. It’s unfortunate that in the world of music there appears to be so much resistance to new ideas sometimes. 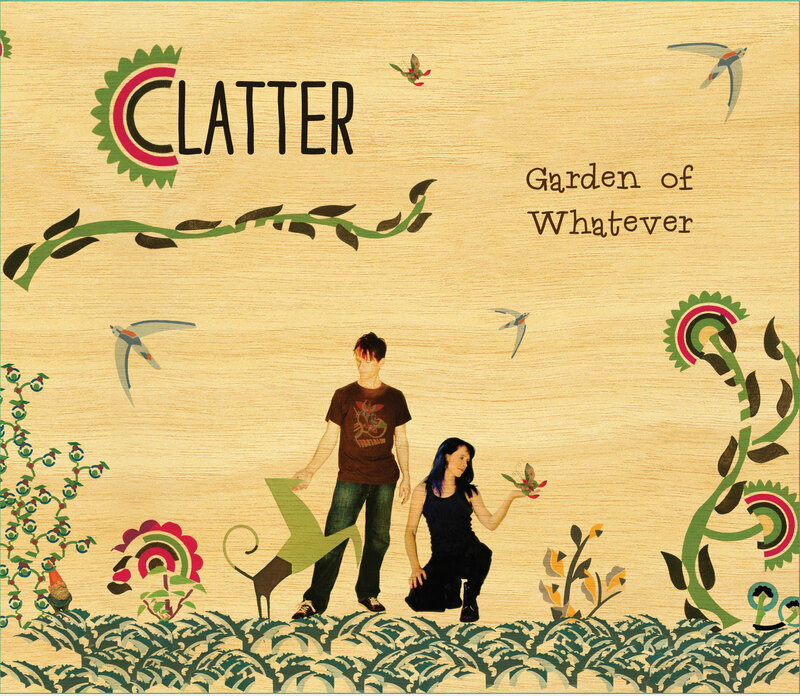 Clatter is a duo from Lone Elm, Missouri comprised of bassist and singer Amy Humphrey, and her drumming husband Joe Hayes. But, that wasn’t always the case. They started out as a band called Clatter Bean in the mid 1990’s, which was a quartet. The singer left, and they started performing as a trio, shortening the band’s name to Clatter. And then, the guitarist split. The idea of forging ahead as a bass/drums duo then entered the picture. With encouragement from Joe, a somewhat hesitant Amy finally agreed to be the sole melodic/harmonic element in the band. And so began the quest to make the bass stand on its own in a rock context. Their latest album, Garden of Whatever, consolidates the path laid out by their previous two releases. Full-bodied and hard rocking bass grooves, Amy’s sweet-toned voice delivering empowering lyrics, and Joe’s dexterous and seemingly inexhaustibly creative drumming make for quite a unique listening experience. If you go through the whole album and your only thought is “it needs guitar,” then you’re quite simply missing the point, and missing out on the Clatter experience. The band’s a duo, and they’re a married couple. So, even though I’ve had some brilliant ideas in my lifetime, deciding to interview both Amy and Joe is not one of them. It was simply an obvious choice. What did the name ‘Clatter Bean’ mean, and why did you drop the second half of the name? 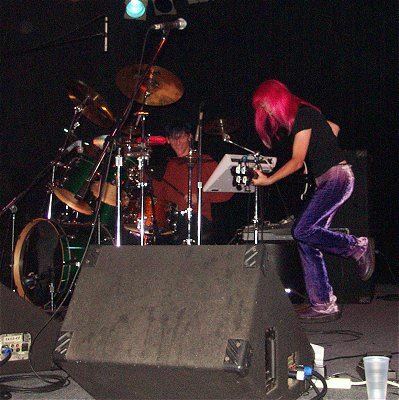 AMY: When we lived in Seattle, I played bass in an all-female band. We were in that phase of band evolution where we had to decide what to call ourselves. One day, Joe and I were driving somewhere and the name “Clatter” just fell out of the sky into my brain (incidentally, this is how a lot of my lyric writing happens). As a linguist, I loved the way the word felt when it was spoken, and that it conjured up a great sonic image. My bandmates, however, thought the name needed a little something extra, so they chose to add the “Bean” part. I can’t really recall the reasoning behind it; I suppose it added a certain quirkiness that reflected the personality of the band. Eventually Joe became the drummer, and when we parted ways with the other two band members, we decided to lose the “Bean” as well. What gave you the idea of playing as a duo? And once that idea entered your mind, was it ever scary for you guys to contemplate that uniquely different path that lay before you? AMY: It was terrifying. For me, anyway. Once we moved to rural Missouri from Seattle, we found a fabulous local guitar player and continued on as Clatter. Eventually he moved on and we were left with just the two of us. Miles from anywhere. Joe proposed that we give it a go as a two-piece; he had tried for ages to get me to play through a guitar rig just to hear what it sounded like. It took a lot of encouragement and arm-twisting by Joe to convince me that I could shoulder the melodic portion of the band single-handedly. It wasn’t that I didn’t think the bass could stand alone as the only melodic instrument in a band, it was that I didn’t have faith enough in my own playing and songwriting that I thought I could pull it off. Once we finally took that leap, though, I realized how fun and freeing it was to be able to play anything I wanted – and as much as I wanted – without stepping on anyone else’s toes. And Joe is such an amazing drummer and has such a melodic approach to the drums that it’s like having another stringed instrument in the band. We decided to record an album (Blinded by Vision) just for our own gratification; we were shocked when so many people embraced it, especially bass players! That gave us the courage to continue. I never found the path to two piecedom to be very scary, I thought it was exciting. After parting ways with our last bandmate, we felt it was time to forge ahead with just the two of us. It can be really difficult to find musicians who have the same vision as you do. Amy and I are in sync, and maybe even more so than other bandmates we’ve ever had because we’re married. We complement each other on so many levels, and that naturally flows into the interaction of the bass and drums. We are a unified section. So I figured that we should just forge ahead as a two piece, and that would create more harmony in the band. Of course, it seems that everyone we told about the project said you can’t have a band with just bass and drums, you need guitar or keyboard. This happened repeatedly until we started to believe what we were being told. So we spent a lot of time working with a keyboard and sequencing layered melody lines, which ultimately relegated us to the role of being the “rhythm section,” much more so than any band we’d been in, which was the antithesis of what we had intended. I think that experience was necessary to help us forge ahead to create the sound we had in our collective heads, and not listen to what anyone else thought. And that’s why the first album is called “Blinded By Vision.” We stopped listening to what other people thought and pursued our idea relentlessly – including walking out of two studios and firing a grammy-winning producer, who wanted to layer in a bunch of sequencer stuff because we didn’t have a guitarist. Hell yeah, we were driven by pure idealism, and Amy almost clocked a guy…that was a sight I shan’t forget. Driving away from that experience we realized that we were blinded by our own vision, and others were blinded from seeing it. It also meant that people couldn’t grasp the concept of what we had in mind. It was all we could see, and they couldn’t see it at all. 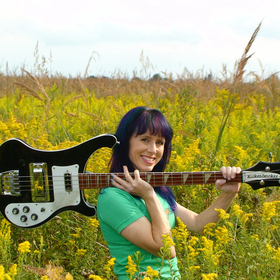 Amy, here’s a quote by you: “Because that’s what it’s all about–trying to show that the bass can stand on its own as an instrument.” How strongly does that ‘mission statement’ of sorts figure in your musical endeavors? 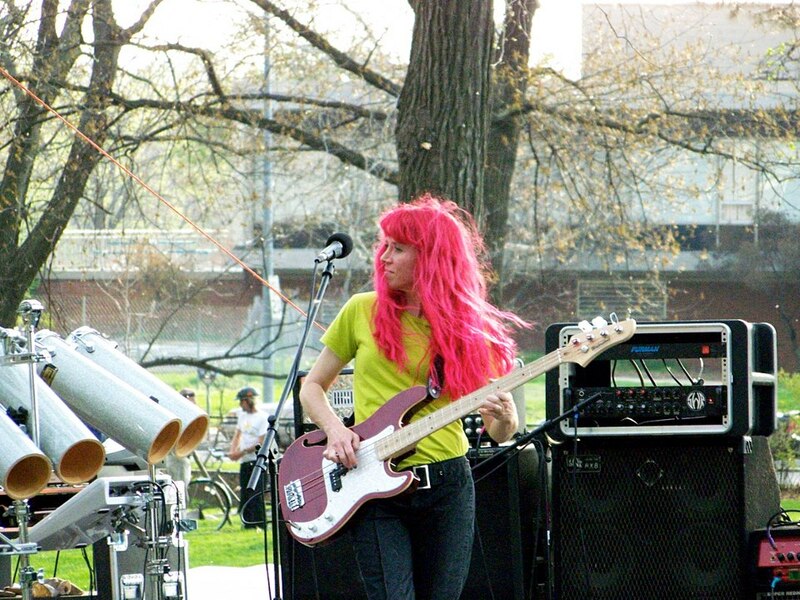 AMY: As I mentioned before, I never doubted that the bass could stand alone as the primary focus in a rock band. Having grown up listening to a lot of bands with busy bass lines, especially in the New Wave era, I have always felt that the bass guitar is one of the most beautiful-sounding instruments. I thought it would be so cool to really let that beauty shine in a setting where it is usually relegated to the background: hard rock. Once I finally committed to the two-piece band idea, I knew I had a big responsibility to demonstrate that the bass guitar can stand on its own. I tried to think of ways to showcase the unique and powerful sound of the bass, to magnify and diversify its tonal qualities and blend these together for a full, cohesive sound. Multiple amps, effects units, playing styles…all these combined to help establish the bass as a melodic instrument in its own right and to try to fill in the space normally occupied by other band members. Of course, what I do is just a tiny example of what is possible, and my “mission statement” would probably include not only my efforts to show the versatility of the bass, but even more, to encourage and inspire other bassists to explore all the possibilities of our amazing instrument and to have the intrepidity to try something completely new and different. Not everyone is as lucky as I am to have a supportive, encouraging bandmate! Can you tell us about the worst naysayer you ever had insisting that you couldn’t play rock without guitar? How did you handle it? 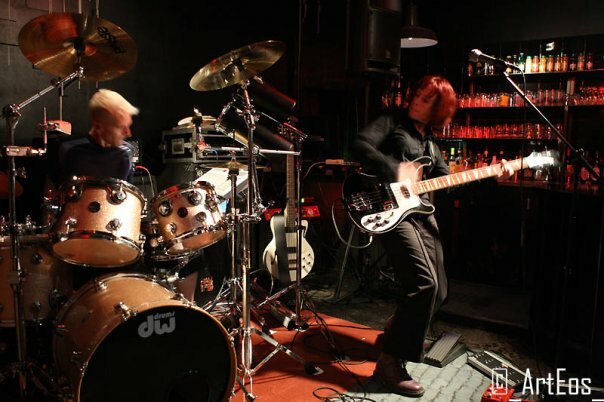 JOE: There have been comments from guitarists and drummers who think in terms of traditional roles for instruments: bass and drums are rhythm instruments to be in the background. We seem to appeal to more adventurous souls. We know it’s not for everyone, and really don’t get bothered by that attitude. Heck, we made the first album just to do it. We didn’t have any idea if people would like it. AMY: I never really know quite how to respond to people when they say things like that. There doesn’t seem much point in trying to convince someone to “get” what you’re doing; either it will resonate with them or it won’t. Most of the time I think I just smile politely and back away. Joe, do you ever hum out or actually play bass riffs as suggestions for Amy to use in the songs? JOE: I used to do that in the long, long ago, in the before times when the world was a dark place full of guitars and crazy bandmates. But after the purgatory of the sequencer years, when Amy plugged into a mighty distorted cabinet and found her new voice as THE stringed instrument in the band, I’ve had one “bass line” idea, and that’s the synth stuff I play on the song Powerful, which I never intended to be a part for Amy to play. Anytime Amy noodles on her bass I think it’s a new song idea. She comes up with the coolest stuff. Amy, do you ever alter a bass part or a vocal melody in order to be able to perform them both simultaneously? AMY: I haven’t done so knowingly. I usually don’t have much trouble singing and playing at the same time. If there is a phrase I have trouble with, I will just practice it until I can play and sing both parts properly. I’ve never actually tried to simultaneously sing and play “Trance” from the new album; I think that one could be pretty tricky! On the band bio it says that you worked a lot on your singing. Could you elaborate on that? AMY: I’ve never really thought of myself as a singer; I’ve always been a bassist first and a singer by default. What’s funny about that is I’ve had a lot of vocal training and zero bass training. My vocal background, though, is more choral and technical, and I have come to realize that that has hindered me as a pop/rock singer. Until recently, I always focused on the technical aspects as I was singing: pitch, vibrato, tone, breath support, etc. I knew I was singing “correctly,” and yet I was constantly criticized for the way I sing, and I found it very frustrating. I have a fantastic vocal coach out of Boston who explained that when it comes time to record or perform, all those technical nuances need to happen automatically, without thought; the focus needs to be on the meaning of the words, the intention of the song; little mistakes or imperfections are important clues to the listener that the singing is genuine and heart-felt. As self-evident as that may seem, it was a big revelation to me. So when I say I worked on my singing, in some ways, I worked at not working on my singing. As I was recording the vocals for Garden of Whatever I tried to let go of years of constant scrutinizing and analyzing and just put everything into the emotion of the lyric. Listening back, I’m really happy with my progress and am looking forward to continuing to improve that aspect of my musicality. On your website, you only list two influences: Rush and Duran Duran. I have a hard time believing there’s only two! Care to share a few more of your influences? JOE: I have a background of listening to some proggy stuff, metal and some punk. Amy listened to lots of heavy rhythmic pop, alternative / underground and punk. The first summer we were dating, Amy took me to see DOA and I took her to see Iron Maiden. We had a blast at both shows, and became mutual fans immediately. We still rip into “Killers” by Iron Maiden once in a while in the studio. Our latest mutual influence would definitely be Mastodon, with their amazing combination of heavy and melodic. Their new album The Hunter has great harmonies and the coolest grooves. When we put those influences together we get Clatter. On your latest album, I’ve noticed more vocal and bass overdubs, and perhaps for the first time some additional sounds beyond those made by bass, drums, or voice. The songs “Strawberry Park,” “At the Gates of…” and “Trance” come to mind, among others. How did these come about, and how do you plan on recreating that live? AMY: As far as vocal harmonies go, I probably did as much on this album as on the other two; I have absolutely no restraint when it comes to layering harmonies! The extra vocal parts are the one thing that we fly in for our live performances, since Joe doesn’t sing and probably wouldn’t want to tackle something in my range anyway. Since we play to a click track live, we’re able to trigger anything we want, but most of the time it’s just background vocals. There are only three songs that had bass overdubs: the little ska-like bit at the beginning and middle of “Tree of Secrets”; the outro in “Glowing”; and the middle and end of “Downstream”. If we were to play “Tree of Secrets” or “Glowing” live, I’d just not worry about recreating those additional parts. The extra parts on “Downstream” were actually written with the looper in mind so that I could play one phrase, loop it, then play the other phrases over the top. The rest of the bass on the album was recorded as one take. If given half a chance, I would go crazy in the recording process layering all manner of bass parts on the songs, but my goal has always been to only record what I could recreate live. JOE: The songs “Strawberry Park,” “Powerful” and “Trance” all feature melodic parts played on my Roland SPD 20 Electronic Percussion Pad. I’d been messing around attempting to play melody lines on the percussion pad while also playing a drum beat on the acoustic set, and these song ideas just started popping out. I wrote the gist of those parts spontaneously as I was banging around on my drums. I run the signal through a Boss Distortion pedal to give the parts some bite. Sonically it reminds me of what Keane do with their electric piano. I recorded the electronic parts for “Powerful” and “Trance” live with the drum set. For “Strawberry Park,” I recorded the drum set first, then layered the electronics as an overdub. Ironically, “Strawberry Park” is the only one of those song we’ve played live so far. It’s actually very natural to play, with the exception of the first half of the bridge, which took me weeks to get together. It was a fun challenge! Plus, it’s cool to play the bass part on parts of “Powerful,” while Amy plays chords on one of her Waterstone twelve-string basses. “At The Gates Of…” features one of our mixers, Rich Veltrop, playing a Roland SH-101. I thought it would be fun to have some kind of vintage synth sounds on that song, kind of an homage to 70’s prog music, and Rich went nuts with it. I sent him a breakdown of the song sections, as I see them, and he did a fantastic job of interpretation. I think it came out perfectly. The song “At the Gates of…” is an instrumental. Would you ever do an entirely instrumental album? JOE: I could see us doing another instrumental song just for fun, but not a whole album. I really enjoy writing lyrics, and am always eager to hear what Amy will come up with next for her lyrics. She has such a great style of writing- it’s so picturesque. Even if we ran out of lyrics, I’d still want to hear Amy “Ooh” and “Ahh” over the music. Joe, I noticed that on the new album you’re credited with electronic percussion for the first time. Could you elaborate? JOE: Well, that’s a good question. I’ve played electronic and acoustic percussion on all three albums and the live DVD, Blinded in Boonville, but I don’t know why I decided to list it differently this time. The other albums say just “percussion,” so I figured that was all-encompassing. Do you ever jam with other people just for fun, such as going to open blues jams or the like? AMY: I’m just not a jamming type of player, unfortunately. I don’t have the versatility or training on bass to improvise or wing it when playing with other people spontaneously, and I never really learned more than a couple really obscure cover songs. I have a good ear so can pick things up pretty quickly if need be, but I don’t think I would have much to add to an open jam. Do you see yourselves ever participating in other projects, perhaps with more conventional instrumentation, whether together or separately? AMY: I enjoy working with other musicians from time to time and have contributed bass tracks to friends’ projects, which was fun. I recorded a vocal album of traditional Christmas carols with my mom and sister several years ago and would enjoy doing something similar with them again. I even performed in a locally written and produced musical, including out-of-town shows. Even though the internet facilitates musical collaborations to some extent, the fact that we live so far from anywhere makes it difficult for us to explore other musical projects. The advantage to that, of course, is that it forces us to be more creative and try new things with just the two of us. JOE: At the moment that is an area I’m considering with a very long pole. The idea of playing with other people isn’t really all that appealing, as I get to express myself without restraint in Clatter. There are no rules and anything goes. That being said, if a situation presented itself that would be a fun challenge (and offer another revenue stream) I would consider it. My most important question of all is this: Vinyl, CDs, or downloads? AMY: Definitely downloads. I always enjoyed the photos and artwork on vinyl albums in my youth, but now I appreciate the portability and accessibility of a digital music library. Any lack of fidelity in the digital realm is lost on me anyway because I tend to listen to music in noisy environments, especially the car. And physical copies just occupy so much space and require storage! JOE: Definitely downloads. I’d just as soon download music – with proper compensation to the artist – than have to mess with a disc. We sold our entire collection of CDs a few year ago, because once we loaded the music into our computer library we just didn’t use the discs. Well, I couldn’t part with my Judas Priest Painkiller CD, but that’s a completely different deal. P.S. I want to thank Amy and Joe for inspiring me in pursuing a similar path. When I started writing songs in 2009, the idea of a guitar-less line-up crossed my mind, but I was a bit hesitant. After all, my songs are more in the heavy metal realm, which is even more guitar-driven. But when I heard Clatter, the sky opened up. Their bravery and originality emboldened me, and I haven’t looked back. 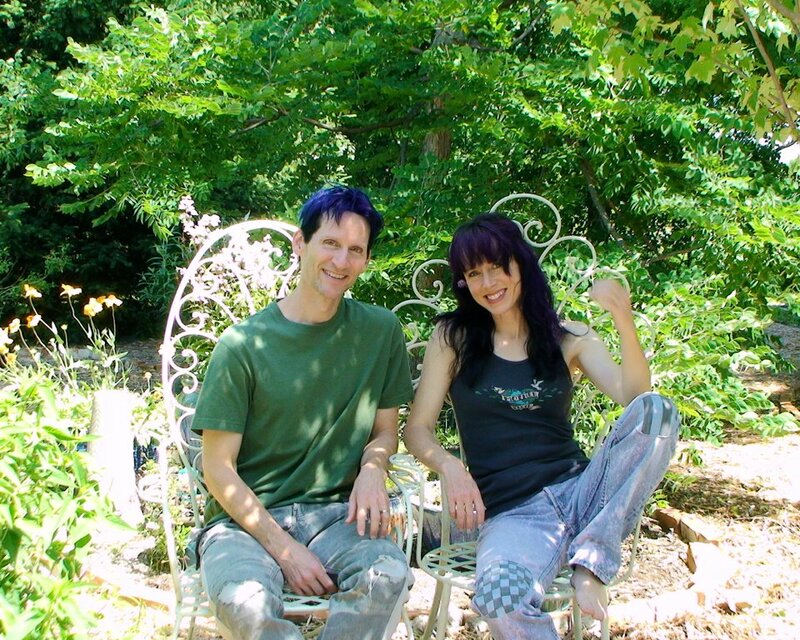 This entry was posted on January 27, 2013 at 10:49 pm and is filed under Bands, Bass players, Interviews with tags amy humphrey, clatter interview, joe hayes. You can follow any responses to this entry through the RSS 2.0 feed. You can leave a response, or trackback from your own site. I don’t have time to look over it all at the minute but I have bookmarked it and also included your RSS feeds, so when I have time I will be back to read more, Please do keep up the great job. I have read so many posts concerning the blogger lovers but this paragraph is genuinely a pleasant piece of writing, keep it up. c’est là où les paquets d’essai antivirus entrent dans le marché de l’informatique . Avast fait un pas en avant dans la popularisation de produits de sécurité avec son . serait demandé en retour . forming lake-type bodies of water adjacent to the main river. dance, art, music and historic Hope College right downtown. Our day always started by walking a mile to the fitness trail for an early morning jog. hair growth hair loss site, in the course of treatment after three months, you can see the thicker and darker hair grow. to the fashion industry. Moody Blues, with another location in Chandler, is a relatively new addition to Scottsdale Waterfront.